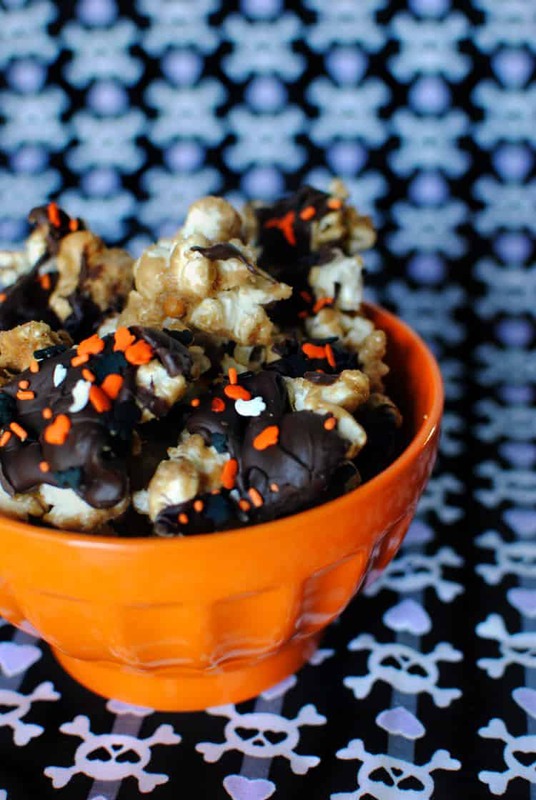 This Toffee Halloween popcorn is a crunchy sweet holiday snack. Popcorn is tossed in a mixture of maple syrup and brown sugar with chocolate chips and sprinkles. Hey there, sweet tooth. I remember walking along the boardwalk with my parents when I was little. It was night time and the whole boardwalk was lit up and people were everywhere. I saw an awesome ride in the distance that looked like a whirly car going down a hill. I pointed to it and my father asked if that’s what I really wanted to go on. So I nodded yes. What he thought I was pointing at and what I actually wanted to do were two very different things. The next thing I knew, I was in my first haunted house. We walked through the winding dark hallways with creepy noises following us, things jumping out at us and general haunted house mischief. I was terrified, but I walked through the whole thing, wondering at what point I was going to get in the car and get to go down the hill. There was no car – but I did go through my first haunted house and live to tell about it. I’m glad that I didn’t have any toffee popcorn in my hands or it would have been all over the floor of the haunted house. If you’ve tried this Halloween Popcorn recipe, or any other recipe on passthesushi.com please don’t forget to rate the recipe and let me know where you found it in the comments below. 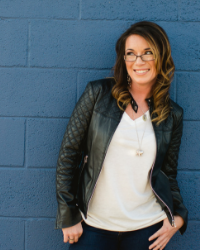 I love hearing from you! You can also follow along for more good eats and travel tips on Instagram @passthesushi & @girlcarnivore, Twitter & Facebook. Melt the butter in a medium saucepan set over medium heat. Stir in brown sugar, maple syrup, and salt. Keep stirring until the mixture comes to a boil. Continue to stir, and let boil for 4 minutes. Remove from heat and stir in vanilla and baking soda. Pour over popcorn and stir until well-coated. Spread on a baking sheet and bake for 20-30 minutes, stirring every 10 minutes. Pour chocolate chips in a microwave-safe bowl. Microwave on high for 30 second intervals, stirring after each until fully melted. Drizzle chocolate over popcorn and top with sprinkles. Refrigerate until chocolate is set. Break up into clusters and serve. Needless to say, I’ve never been much for haunted houses – but I love a good ghost story and can appreciate a bad horror movie from time to time. It’s October and Halloween is coming quick; we might as well get a little creeped out for it. 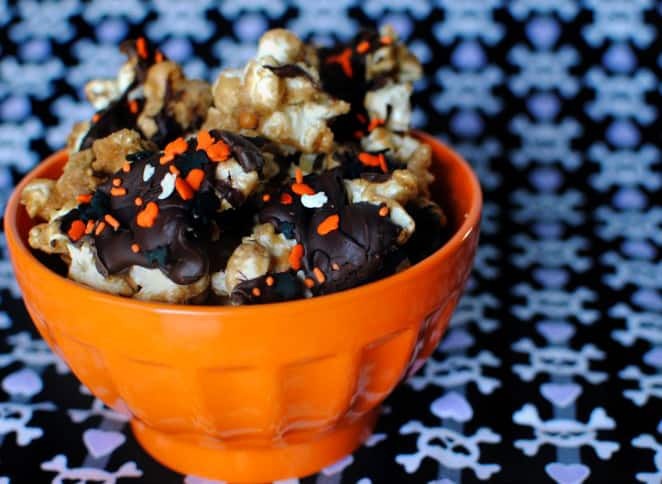 Let’s make a promise to eat lots of toffee popcorn with Halloween sprinkles, too. Want to make some other Halloween treats? Check these out! What a great snack! These look so yummy! Oh my gosh, I don’t think I’d be able to resist if I saw a bowlful of this popcorn in front of me. With that chocolate, maple, and toffee, there’s just so much to love about it. I want to have a Halloween party just so I can use this recipe.